RHYS BOWEN: I have just returned from a wonderful trip that took me to Turkey, Egypt and Greece. Turkey and Egypt were new to me, places I had long dreamed of visiting. Istanbul seemed to me a delightful city with a grand bazaar right out of the thousand and one nights (too bad that it has now erupted in rioting and unrest). Egypt was a sad and sorry place, one that the tourists now shun increasing the poverty and desperation there. Piles of garbage line the streets, half built buildings everywhere, no traffic rules, no jobs and presumably ripe for Islamic extremists. But Greece was another matter. I was visiting it for the first time in 50 years. Fresh out of high school, naïve and idealistic, I had spent three months wandering around Greece with my friend Ruth. We took local buses, rusty ferries and slept in private houses or tiny hotels. Two girls alone in a land where they kept their women firmly at home. When we ate in cafes we were always the only females. We got used to men propositioning us and old women inquiring why we weren’t married yet. I don’t know why I had resisted going back for so long. Perhaps because I had been told that it had changed so much and become so commercial that I would be disappointed. So it was with apprehension that I watched Mykonos as our ship steamed into the port. But there were no giant Sheratons or Hiltons to be seen. The town looked as it always had—small gleaming white buildings, blue water in the tiny harbor. True there were many more stores and more cafes but it was still enchanting. We had spent two weeks there on my previous trip, buying warm bread and cheeses and grapes before catching the rickety bus to a deserted beach on the far side of the island. No deserted beaches these days—our beach is lined with umbrellas and chairs. I was even more worried about seeing Athens again. I had heard it was dirty, smog ridden and the Greeks were always having dangerous protests against austeries. But it was still magical with the Acropolis sparkling in sunshine and the evzones parading outside parliament with their “ministry of silly walks” and pom poms on their toes. And the Greeks were still charming, friendly and laid-back. Everyone wanted to chat, to ask where we had come from, how we liked it there and interested that I had been to Greece so long ago. True the main square was shut for a demonstration once, and we saw a parade of far right black shirts that was scary, but I would go back again in a heartbeat. So I’m wondering, fellow Reds, have you ever dared to return to a place of your youth? Were you disappointed? HALLIE EPHRON: A few years ago we went back to Venice - and I felt just that apprehension since it had seemed like such a magical place when we were there on our honeymoon inn 1969. We were not disappointed. This time we steered clear of the Piazza St. Marco which has become ridiculously crowded. The shopping is still extraordinary, the city a work of art, the food fabulous, and there was even a Vaporetto strike like there was the last time we were there. 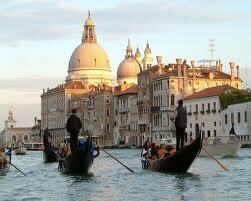 RHYS: Hallie, I also went back to Venice for the first time since my childhood and found it as entrancing as ever! One of my favorite places. HANK PHILLIPPI RYAN: My mother used to say "Never return to the scene of a former glory." I suppose that was her way of preventing us from trying to recapture something wonderful--that the memory and the experience of a thing is singular--and that new is better. However, my 89-year-old father and his dear wife have just departed for Paris. For the millionth time. They're off to have a birthday dinner for Juliet at the same restaurant where they celebrated 10 years ago, Les Bookinistes. Dad said, when I called him to say bon voyage, "Paris is always wonderful." I'm trying to figure out what we can learn from this. ROSEMARY HARRIS: My husband and I love to go to new places so I suppose we only return to those places we know we still love. Recently that meant Florence, Rome...and Gettysburg, PA. I'm more likely to have the "you can't go back" experience with books or movies. The first that leaps to mind is The Adams Chronicles. I remembered loving it and in 2013 it was pretty tough going..
DEBORAH CROMBIE: I've never been disappointed in London or Paris. It's been years since I've been to Italy or the south of France, however, so I do wonder if those places would hold up to the memories. I adored Germany on a book signing tour a couple of years ago, much more so than on brief trips in the late 70s. I was talking to a friend the other night who had spent much time in Mexico City on business, and wondering how I would feel now about Mexico City and Guadalajara, cities where I spent much time from childhood into my twenties, and loved. RHYS: So, dear friends, have you ever gone back to a place that was special for you? Were you disappointed or glad that you did? Rhys, Mykonos sounds wonderful. Your description of the town is very enticing. I now find myself craving warm bread and cheeses and grapes! When I was a little girl I lived with my great-grandmother at her camp in Billerica, Massachusetts. It was in a beautiful pine forest near a river. The house was very simple. We had to pump our water outdoors with a hand pump. All of the important facilities were outside. It was a challenge keeping warm in the winter, because the camp was not insulated. We loved it there all the same. I went back to visit in my 20s when I was a newlywed. Almost everyone I had known there was still there including "the boy next door." Our relationship began when we were three, and I bit him on the bum. I received such a terrible spanking in return, that he felt sorry for me, and we became best friends and more later on. So I was a little nervous when the girlfriend I was visiting called him up. All she said to him was, "Dinner at my house if you can guess who's here." Then she started laughing and said he was coming right over. There we were a bunch of old friends sitting in the dining room and me with a Steve to my right and a Steve to my left. Something clicked between them and the two very quiet, introverted, engineer Steves started talking. They wouldn't stop. It was so funny that's all the rest of us could talk about. It turned out to be a great time. few years later I read the ads for The Graduate - realized the star was our stage sweeper... his name, of course---Dusty Hoffman!!! Thelma Straw in Manhattan!! Lucy, I've been carrying similar memories of my junior year in Aix-en-Provence, more than 40 years ago. While the joys of first tasting ratatouille and pizza aux fruits de mer were unforgettable, so were the rebuffs and overt discourtesies encountered in the shops and public offices. As a naive young student from small-town Ontario, I took it personally. But a couple of years ago, I read a novel by one of my French professors based on his childhood in WWII-era Provence, and that was a different kind of revelation - about someone I thought I knew. For many Aixois and Marseillais, those brutal wartime experiences were pretty fresh. I finally understood that our early experiences in an exotic locale may reflect our limitations as well as our youth, and that the wisdom acquired in our own lives might just make for a more rewarding return later. Thelma! What a FABULOUS story! Rhys, I second Reine. Your account of both visits to Mykonos was a delight! I grew up all over the country with a military father. Spent my last two years of high school in Manhattan, KS (known as "The Little Apple"). I hated everything, mostly because I was so miserable at home. We were poor, and I was unhappy at the high school where they'd all gone to first grade together. Couldn't wait to leave. I returned to Manhattan when my mother died a few years later and then a decade later when my stepfather was dying. I had to spend a lot of time there at that time and fell in love with the place, as did the guy I was living with. It's a beautiful little town surrounded by the Flint Hills and the Konza Tallgrass Prairie. Gorgeous! When we married, we honeymooned in Manhattan, the Little Apple. Still, I was unsure about finally attending a high school reunion. I'd been so unhappy in high school. But I went, and it was great fun, and I've reconnected with many of my classmates, who've become good friends and supporters of my work. Sometimes, when you go back, it's better. What terrific stories. Thanks for sharing. It takes courage to do things at which we might fail or be disappointed. My college friends and I get together every three years now and that is a wonderful way of keeping our relationships present and flourishing. Rhys, thank you for taking us with you on your fabulous trip, both times. I would love to go to Greece someday, and Istanbul has been on my list for a long time, too. The world is such a big place, it's almost too much to hope for revisiting any particular spot. But when my husband and I were just dating, and then as newlyweds, we went to Florida together. I learned to identify birds sitting in the car while he drove from one lecture date to another, just by looking out the window at the amazing diversity of bird life there. Now our daughter lives in Miami (although she's moving to Lexington, 90 minutes away! Squeee! ), so I've been down there several times in the last four years to visit. The birds are virtually gone, it's so horrifyingly sad, I can't tell you. And forget the huge turtles and alligators we used to see along the road, I have not seen either while driving in 20+ years. There also used to be tens of thousands of acres of orange, lemon, pecan and other trees in the northern half of the state. All gone, replaced by endless urban sprawl. Even the Everglades is nothing like it used to be. Oh, Karen, that's so horrible to hear about Florida's wildlife. Sometimes I think our corporations won't be happy until we've blanketed the whole earth with concrete. Thelma - too funny! Wonder what ever happeened to Larry. Do you still see that friend? Maybe I should give the Adams Chronicles another chance. The first time I went to Greece was eons ago - and even back then people said it wasn't "what it was 20 years before." I returned about 5 years ago and people were saying the same thing. I truly believe you bring your party with you. Thelma, we must hear more about your impressions! Mary, you are so right about how our limitations and youth can affect our impressions of a place. I felt so desperately homesick, that I'm certain I couldn't try very hard to fit in. I'm looking forward to seeing Provence with wiser eyes this time! In high school, I spend a summer in Costa Rica and a summer in Panama doing volunteer work. What a momentous experience, and talk about homesickness! Would I go back? Probably not. I'll definitely go back to Ireland, but that's for novel research. I grew up in a idyllic town (Rhys, I'm sure you're familiar with it: Mill Valley! ), but I don't return to it that often either...However, when I do, my soul sighs. I have certain rituals: must hike to Tennessee Vally Cove, must drive by my childhood home, must sit around the plaza at the Book Depot. HURRAY! And the winner of Edith Maxwell's book is: Dianne (from Orlando)! Email Hank at h ryan at whdh dot com to get your prize! It's funny this should be the topic. I was at a brunch yesterday and the featured speaker was Richard Blanco, the poet who gave a reading at Obama's Inauguration in January. He's a Maine resident but grew up in Miami. He read a poem called "Looking for the Gulf Motel" which is about going back to Marco Island where they'd go every year. It's a great story and it's available online. That reminded me of the places we'd go as kids...Paragon Park in Nantasket, Adventureland in Newbury and Pleasure Island in Wakefield - all in Massachusetts. I was enthralled as a small child but we'd go back with my littlest siblings the rides weren't as much fun, the cowboy shoot-outs were really corny, and the magic just wasn't the same. I guess that's just the story of growing up. I first went to Europe was I was 17. The magic there has NEVER gone away. Thank you, Rhys; I loved the accounts of your trip. When I was twelve, my parents drove the five of us kids one Sunday up to northwestern CT to see the quaint country inn where they spent their honeymoon. Sadly, the house was gone, and in its place was a gas station! Marianne, thanks for the shout-out to my pal, Richard Blanco, who's a real sweetheart and a gifted poet. A lot of his poetry, in fact, is about going back to what we knew when we were young or to what we never knew but our parents and grandparents pounded into us, only to find that "it" or we have changed too much for comfort. Linda, he was fabulous! He had us all in tears one minute and laughing hysterically the next. Count as places I can't go back is Flagstaff and Sedona, AZ - I spent summers in that area when I was little. Sedona was unpaved with a horse rail. Yeah, Richard is pretty fabulous. He gave me the title for my next book of poetry, Dark Sister. He's a seriously gifted, dedicated writer--and tons of fun. So glad you had a chance to spend some time with him. Lisa, Tennessee Valley trail is one of my favorites in the Bay Area. As are all the trails on Mount Tam and out at Point Reyes. We're so lucky with so many world class hiking trails in my backyard. But also my childhood home, a big rambling house among orchards, has long gone, victim of the new M25 motorway construction. There are some places you can't go back to. When I was 5 or 6 we lived in a tiny town called High Vista. There was a rock formation called the elephant rock all the young kids (including me) used to climb on it, then jump off. It was the height of bravery at the time. When I went back at the ripe old age of 13 I was astonished. The elephant rock that had seemed so tall and dangerous was maybe hip high. It was my first true lesson in perspective!